Resistant Bacteria is Now a Global Emergency: Solution? Nano Silver! Antibiotic Resistance is real and a growing problem of epidemic proportions all around the world, says a new article in the Guardian*. Antibiotic resistance is caused exclusively by the use of – WAIT FOR IT….. antibiotics. While trying to pin the problem on reckless antibiotic use in developing countries, the fine print late in the article admits that developed countries like the EU, UK and US, use these dangerous – and, if you know what to do instead, unnecessary – drugs. While saying that sanitation and clean water would help a lot (and they would for people who do not already have them available) the article goes shrill when it irrationally says that although antibiotics do not work for viruses and most of their use is against viruses, the “cure” there would be more vaccination (!) since flu and intestinal viruses are major problems in most of the world. Hold on there! Vaccine science is junk science: if you look at the reality, not the ceaseless hype, there is, to my mind, absolutely no reason for using vaccines since they weaken the immune system, do not prevent disease and increase incidence and severity of disease. What’s the solution? The amazing nutrient — Nano Silver 10 PPM Solution which I most heartily recommend. Why? First of all, unlike EVERY antibiotic, it is non toxic. Absolutely and totally non toxic to anyone, mother, child, baby, granny, puppy, kitty. NON toxic. FDA prohibits us from calling Nano Silver 10 PPM an “antibiotic,” which, it turns out, is a good thing because we certainly do not want this near-miraculous nutrient confused with toxic drugs. And unlike antibiotics, when the immune system encounters a disease-causing virus, and that immune system is supported by Nano Silver 10 PPM, the course of events is just what you would want, and just what an antibiotic cannot provide: a vibrantly normal immune structure and function. The article admits that it was sanitation and hygiene that reduced the infection rate in developed countries and that such infrastructure is needed in the rest of the world: “Without fresh interventions to curb overuse, the number of antibiotics handed out globally could rise more than 200% by 2030, from 42bn doses per day in 2015 to 128 billion, the researchers predict. “In high income countries, the most important thing that reduced mortality from infectious disease in the 20th century was infrastructure,” Klein said. “Separating waste from drinking water and chlorinating it was one of the most important things we did.”” As I’ve always said, sanitation, hygiene and better nutrition, as part of a healthy lifestyle. But somehow vaccination gets introduced as a solution (full shill) because, well, you know… [blankout…] Vax worship, you see, is part of the economic religion of the ruling class. The reality is that neither bacteria nor viruses nor parasites like malaria develop immunity to Nano Silver 10 PPM because its mechanism of operation is very different from that of antibiotics. It is a nutrient that supports normal cell membrane integrity as it supports normal immune system function. It is estimated that antibiotic resistant organisms will kill 50 million people world wide within less than 3 years. But if your immune function is supported and protected by Nano Silver 10 PPM I know of no disease-causing agent that can stand against it — and it is non toxic. Remember, if a resistant organism is circulating in the community, or the hospital or the school or the restaurant, it will make people very sick, possibly killing a great many of them. Unless…. That is why I urge you strongly to take this warning seriously and make sure that you, personally, and the people you care about, have an adequate supply of Dr. Rima Recommends Nano Silver 10 PPM on hand. With a shelf-life of pretty much forever, having it in reserve is a very safe, and a very smart move to make. Even smarter and even safer is to make sure that you get a regular serving of this remarkable nutrient on a daily basis. One 16 oz bottle provides 96 adult servings. I know I do: I never miss my capful in the morning. Globalists Prove Me Right: They’re Nuts! MP PREFERS AUTISM TO MEASLES. NUTS! For those of us trying to figure out whether the globalists really are as nuts as I have been saying they are, we owe a debt of gratitude to an up-and-coming Labor Party politician in Australia. Take it from me, she is really nuts. She’s also a member of Parliament in Victoria, Australia and the mother of an autistic child. She is loudly supporting a bill to capture every child in Australia and force them all to be vaccinated regardless of the parents’ desires, and violating their Informed Consent. In this matter she asserted, publicly, and in Parliament, that she would prefer having an autistic child to nursing one with a “vaccine preventable disease“. Does that mean she is advising new mothers to forego nursing to assure babies are vaxed as young as possible? Brast-feeding transfers natural immunity to the infant thereby decreasing any alleged benefit. It is for that reason that the CDC recommends vaccinating, but not breast feeding, infants. The CDC is nuts too. There is strong indication in the literature that nursing mothers pass natural immune factors to their babies, and we cannot have that, can we? Here’s a very partial list of supposedly “vaccine preventable diseases”: measles, mumps, whooping cough, German measles… So this super compassionate mom and upstanding Member of Parliament would rather poison every child in the nation than spend 3 days soothing a cranky, itchy, slightly feverish kid (measles, mumps, German measles, chicken pox) or, for a whole week, having to take a toddler with a croupy cough into the bathroom and turn on the hot shower to ease the child’s breathing? And no one rose from the benches to question her or her wretched grip on the life sciences and common sense?? For shame! Read my so far unanswered letter to her, here: http://www.opensourcetruth.com/dr-rima-responds-to-mp/. I replied to her when our esteemed Australian colleague, Adam Crabb, of the highly informative Crazz Files sent me the report of her foolish and illegal stance. We are working with our Aussie allies to make sure everyone in the Vaccine Choice Movement understands just how far from rational, humane and lawful behavior the vax pushers are willing to go. Will there have to be another Nuremberg Trial, like the Nazi Doctor’s Trial, which enshrined the Nuremberg Code and our universal right to Informed Consent, declaring its violation a crime against humanity? As a psychiatrist, I must tell you, I consider this political woman not only dishonest, dangerous and a willing participant in a crime against humanity, but possibly clinically impaired. General Bert warned us that Informed Consent is the defining issue of the 21st Century. The absolute Madness of the Globalists guarantees the truth of his insight. Oh, by the way, Bill Gates’ former family doctor tells us he and Melinda do not vaccinate their kids, only ours. Where do you stand? Big Pharma: Afraid of You and Truth! Many doctors are on the take, big time. Pediatricians with “fully vaccinated” patient loads make huge amounts of bonus money from vax makers and more than half of their income is from injecting pus and poison into those young patients. How are such bribes even legal? Because Big Pharma campaign contributions (the real interference in the elections) buys government power for drug company profits. Look what happened in California where millions were spent to support Bad Doctor Pan and his SB277 Forced Vaccine Bill, signed into law by CA Gov. Jerry Brownshirt. Caring parents there are homeschooling or moving to freer states. It’s not just the vaccine profits, with no risk of law suits from vax harms, but it’s the “downstream” profits from chronic diseases triggered by vax toxins that Big Pharma craves so badly. For example, autism is now becoming even more profitable than cancer. It’s already there in the UK and the US is moving rapidly in that direction. Then Big Pharma has us stricken with BOTH cancer AND autism at epidemic rates. It gets worse. The Bad Doctors use Bad Science to force dangerous drugs on an unsuspecting public. Big Pharma loves Bad Doctors, and when one of them achieves nearly 100% “vaccine compliance” they can receive cash rewards in the hundreds of thousands of dollars annually (or more) from the drug makers. Can you spell “KICKBACK”? However, not all of our medical professionals are Bad Doctors. There are thousands of Good Doctors who know natural means to achieving and maintaining health are what real health care ought to seek. Those who have not been murdered continue to bring you real health and healing. We’ve supported the Good Doctors and helped Natural Solutions Supporters learn about them. Here, for example, is a posthumous virtual interview with the very Good Doctor Moulden, created by our friend Richard Sacks — https://youtu.be/_M4EhOe6t9w . Dr Moulden’s highly suspicious death did not stifle the real results he found: every single vaccine dose administered causes real, visible and identifiable damage – to each person who receives any vaccine. And then he showed how to identify that damage. And he died. Mysteriously. Sometimes it’s really tough to be a Good Doctor. Dr. Suzanne Humphries has received a vile death threat. Dr. Rima and General Bert received them from a supposed “Health Freedom supporter” several times. General Bert, while not a doctor, was a vocal health freedom advocate. His death, on his birthday last year, is highly questionable. We all know the story of Dr. Andrew Wakefield who blew the whistle on the MMR Vaccine connection to gastrointestinal problems that are frequently associated with autism. He was viciously persecuted and lost his license, even though the “evidence” had been trumped-up by a now defunct fake news newspaper whose owners had a direct financial stake in the vaccine industry. It’s taken him years to be vindicated. 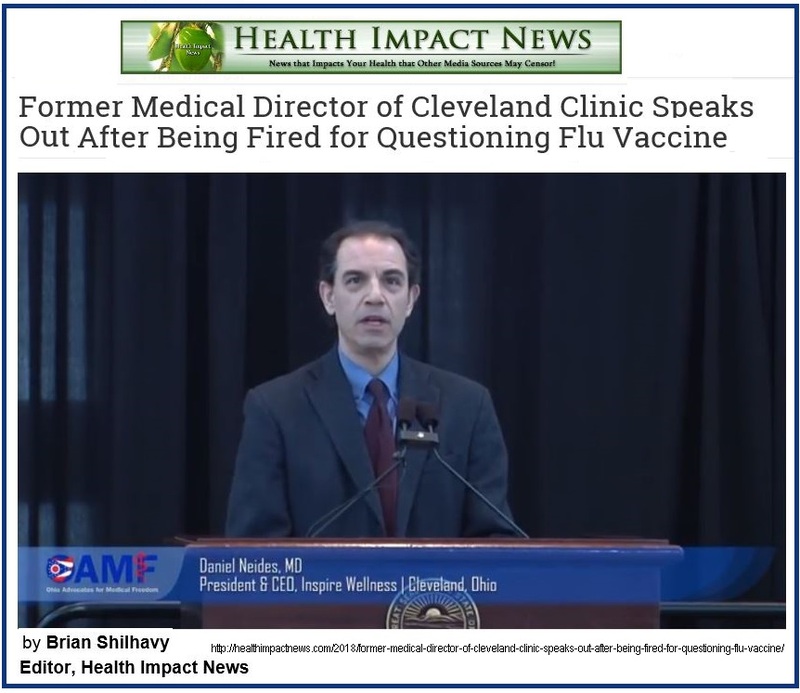 But what is worse, from Big Pharma’s viewpoint, are those Bad Doctors who turn Good like now former medical director of the Cleveland Clinic who was fired for daring to merely question publicly the safety and efficacy of vaccines! He said he chose to use mercury and aluminum free vaccines when available. And then wrote an article horrified that the so-called “preservative free” version of the vaccine contains formaldehyde, a known carcinogen and that he got the flu after the flu shot, as so many do! The number of Good Doctors is beginning to grow. That means that informed patients are listening — and sometimes actually teaching their doctors and helping them in their transformation. The long nightmare of deadly illness-for-profit is slowly ending. The Truth will win out. It always does. But it wins out only if WE, collectively, and YOU, individually, pay attention, and share that Truth on the social media, in your conversations, in your social settings, by email, etc. Without YOU the Good Doctors will be destroyed by the Big Pharma Deep State — and without the Good Doctors, WE all will be destroyed by the Big Pharma Deep State. And you and your children will suffer. Please take the next step for your sake, the sake of the Good Doctors and for the sake of all of us: We need you to share this article on the social media and we need you to help us “grow the list” — your support on Natural Solutions Social Media [Facebook link: https://www.facebook.com/NaturalSolutionsFoundation/ ] and your presence, along with your Circle of Influence, on our Health Freedom eList [Sign-up link: http://drrimatruthreports.com/action/step1/ ] will make all the difference. The Deep State “email service providers” just chopped another ten thousand addresses from our eList. We need to get the word out; if you do not receive at least weekly emails from Dr. Rima you know you have been chopped and need to sign-up again. It takes some effort to stay in touch, but that effort is worth it, since Natural Solutions is your link to Health Freedom Truth! That’s how we can make sure the Good Doctors are heard. That’s how we retain our Health Freedom rights. Remember, General Bert said “Informed Consent is the Defining Issue of the 21st Century.” He was right. It is. Let’s make sure that WE define it, not Big Pharma. These past several years, across the so- called Civilized World, from California to Italy; from France to Australia, alleged democracies are adopting draconian laws to force parents to vaccinate their children against their wishes and beliefs. Initially, decades ago, laws were adopted requiring a limited number of childhood vaccines as part of public school attendance. All these laws allowed doctors’ medical excuses for individuals who were, in the words of the US Supreme Court, “not fit subjects for vaccination…” (Jacobson v Massachusetts, 1905). Nearly all allowed religious and or other conscientious exemptions. In the middle of the 20th Century the international law of Informed Consent, developed in response to horrendous violations of the dignity of the person during World War II. The roots go back much further, to case law holding that a physician who engages in a medical intervention without the Informed Consent of the person commits an assault and battery (Schloendorff v. Society of New York Hosp, 1914). For reasons about which we could speculate our elected representatives have forgotten these salutory limits on their authority. It started in California where a measles outbreak triggered among the vaccinated became the excuse for a new law, SB277, which conditioned attendance at school upon receiving dozens of vaccines, with no religious or philosophical excuse allowed. Gov. Jerry Brownshirt signed the bill although the California Constitution guaranteed a “free public education” to each child. Apparently lawyer Brownshirt had never heard about “unconstitutional conditions” — making someone surrender one right to gain another. And the ball began to roll. Australia adopted a law conditioning child financial benefits on vaccination, with only medical excuses allowed. For many families the choice became having food on the table or vaccine-free children. This law was adopted despite clear constitutional language protecting the universal right to Informed Consent. More recently both Italy and France have seen forced vaccine laws, met in Italy with mass demonstrations against the new requirements. People across the world are rejecting these requirements and asserting their rights to Informed Consent — http://tinyurl.com/AVDcard. So now the vaccine enforces have raised the ante again. The Australian Government just introduced a law, with the full support of the “Opposition,” making it “child abuse” to refuse to subject your child to what courts around the world have called “unvoidably unsafe” vaccines. Doctors in Australia who are issuing medial exemptions are having their licenses suspended. Late last year the US Congress adopted the “21st Century Cures (sic) Act” which, among other impositions, unlawfully exempts drug companies from obtaining written Informed Consent in certain circumstances. Around the world it goes. The power of the vaccine pushers appears to be acendant, but, in reality, what is happening is that the opposition to forced vaccination is growing so rapidly that the Government-Pharmaceutical Complex is forced to move to ever more draconian measures to enforce the vaccinate-at-any-cost policy. The globalists push back hardest just before their anti-freedom policies collapse. What will that accomplish? When implemented it will save at least 250,000 children in the USA alone from developing autism, and over 15,000 babies dying from “Sudden Infant Death Syndrome” — SIDS, another name for vaccine injury. And that’s five years worth fighting for. We KNOW There Will Be Another Plague Cooked Up and Ready For Us! Don’t Miss Out — Order It Before It is Gone! Dr. Rima recommends this Nano Silver 10 PPM for a very good reason: there is absolutely nothing like it to support your immune system. That means no matter what virus, bacteria or other ‘biological bad boy’ you encounter, your own defenses are supported. But there’s a problem: it is hard to make and we are running low. So to protect yourself and your family. Now is a good time to order your supply to protect yourself and your family from “Plaguezilla“. To help you make sure you have enough on hand, buy 6 bottles — we will give you an Advanced Vaccine Directive card, a $30 value as our gift. Purchase 12 bottles and we will send you 2 Advance Vaccine Directive cards as our gift, a $60 value! Nano Silver 10 PPM (pure distilled water and silver) has a shelf life of pretty much forever. You will be sure to have a goodly supply on hand and enough to ‘share the wealth’ with people you care about. Order your Nano Silver 10 PPM now before we run out and have to put your order on a waiting list!